INFINITY #16 - Barbarella, Italian Sci-Fi - from the UK! 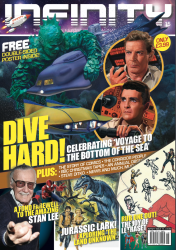 MyMovieMonsters.com > Monster Magazine Marketplace > INFINITY (UK) > INFINITY #16 - Barbarella, Italian Sci-Fi - from the UK! From the publishers of The Dark Side in the United Kingdom comes INFINITY, a magazine dedicated to sci-fi and fantasy. This is Issue #16, Barbarella, FX Maestro Gary Pollard. - Marvel in the U.K.
Glossy full color 66 pages. Copyright January 2019 Ghoulish Publishing. Missed Issue #15? Use the convenient Buy Both button below!